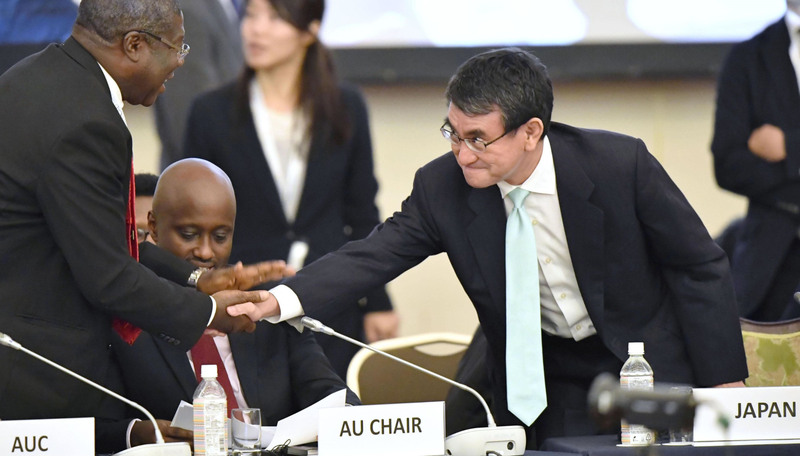 Ministers from Japan and African countries agreed Sunday that they urgently need to take policy actions to address the continent’s “vulnerabilities” and achieve its sustainable economic growth. Representatives from 52 African nations who gathered in Tokyo for a two-day ministerial meeting identified challenges, ranging from building infrastructure and better utilizing human resources, particularly young people, to beefing up maritime security and boosting resilience against climate change. As demand for infrastructure building has been on the rise across Africa, proper debt management for such projects has been increasingly seen as necessary. 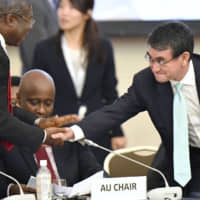 Foreign Minister Taro Kono said he and the other participants shared the importance of making sure that borrowing countries can pay back debts and sustain fiscal health. “The basic principles of our TICAD process are transparency, consistency, and follow-ups,” Kono told a news conference after the two-day meeting, held ahead of the 7th Tokyo International Conference on African Development (TICAD) summit scheduled for Yokohama next August. His remarks came amid growing concern about defaults by some African countries borrowing heavily from other countries, particularly China, which has been increasing its clout in the continent with massive investment. In 2016, Japan pledged $30 billion in development assistance from both the government and private sector for Africa over a three-year period. But Kono acknowledged that progress made so far has not been sufficient, saying the “deterioration of debt sustainability” in some African countries has prevented Japan from extending yen loans. Enhancing connectivity through quality infrastructure is important for Africa to engage in global trade and seek growth led by the continent, according to a cochairs’ summary released after the meeting. The delegates also called for digital, institutional and people-to-people connectivity as all of the domains are “central” to Africa’s development, the summary said. Japan launched the TICAD framework in 1993 to put sharper international focus on African development. Africa now faces more diverse and complex needs in the face of economic growth. Under its strategy to realize a “free and open” Indo-Pacific region, Japan seeks to enhance connectivity from Asia all the way to Africa. It also aims to promote health care coverage for all and share knowledge and expertise in disaster response and prevention. The promotion of quality infrastructure is one of the initiatives undertaken by Tokyo, not just in Africa but in Southeast Asia. Japan and Southeast Asian countries located along the Mekong River are scheduled to hold a summit Tuesday in Tokyo with connectivity high on the agenda.